Vendors compete, prices drop, you save. 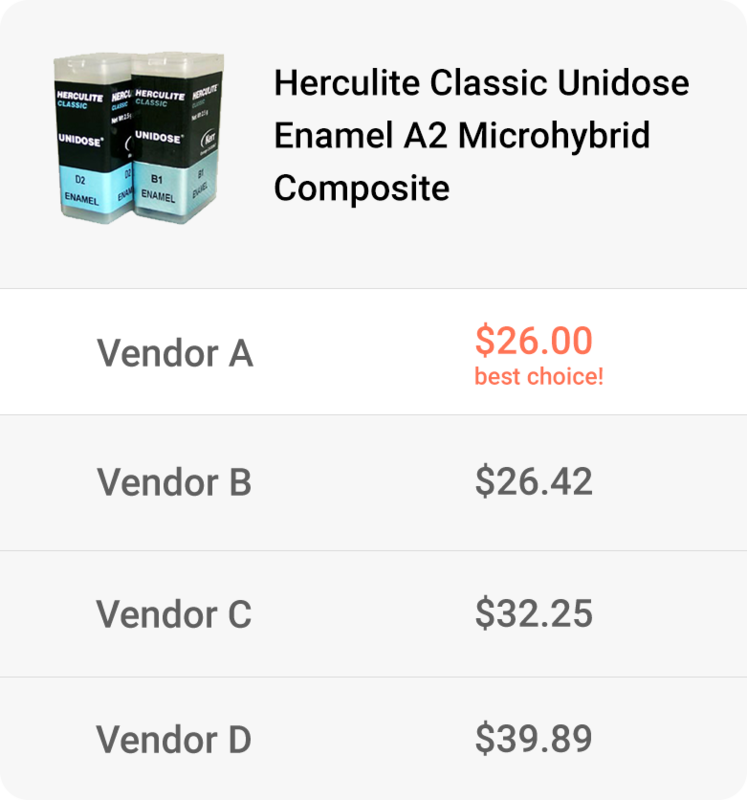 Our marketplace can save you an average of 48% on your dental supplies by finding the most competitive prices from hundreds of vendors. Our agents are here to help 6 AM–8 PM, Monday–Friday ET. Personal reps with direct phone numbers and email addresses make up our amazing support team. No membership fee. No annual fee. Get fast delivery and great savings without paying extra fees. Many vendors have free shipping or a low free shipping threshold that can save you even more. Join over 38,000 dental offices that have saved over $165 million. For almost 20 years, Net32 has worked collaboratively with numerous manufacturers and distributors to provide the best possible quality, price, service, and selection. Net32 is a comparison-shopping site for dental offices to order supplies. It aggregates the catalogs of many vendors into a huge catalog of over 90,000 unique products, empowering dentists to compare individual product pricing across vendors automatically, saving dental offices more money on dental products than anywhere else. Is Net32 a distributor of dental products? Net32 is not a distributor of dental products, and does not warehouse, pack, or ship products. Net32 owns and runs a comparison shopping marketplace where manufacturers and distributors sell products directly to dental offices. Net32 simply assists both parties to manage the transaction. Net32 works hard to ensure that Net32 is an efficient platform for both vendors and shoppers. Why are Net32’s prices so much lower? Net32’s prices are so much lower because Net32 enables numerous dental vendors to compete for your business in an open capital market. Their prices are already low from the start, and competition drives prices even lower to industry leading levels. How can a service so good be free? Founded by a dentist to help dental offices keep inventory costs under control, Net32 has been, and always will be, a passionate advocate for the financial well-being of dentists, and is 100% committed to providing a free service to dental offices forever. Net32’s model calls for Net32 vendors to underwrite the cost of supporting the marketplace. How does Net32 ensure the quality of products sold by so many different vendors? Many trusted vendors have been with Net32 10 years or more and we work with all vendors collaboratively to provide the best possible product quality, selection, price, and service. The products that you purchase from Net32 vendors are products that are manufactured and distributed by the manufacturers themselves, genuine products that you should expect to perform as such. In fact Net32 sets the highest standard in the industry for ensuring complete satisfaction by backing up every purchase with the Net32 30 DAY MONEY BACK GUARANTEE. You can save more on Net32 with our real-time shopping cart savings engine. Activate by clicking the link “Yes, save me $100” located above the Order Summary. The Shopping cart engine will find the best possible combination of vendors + pricing + free shipping.